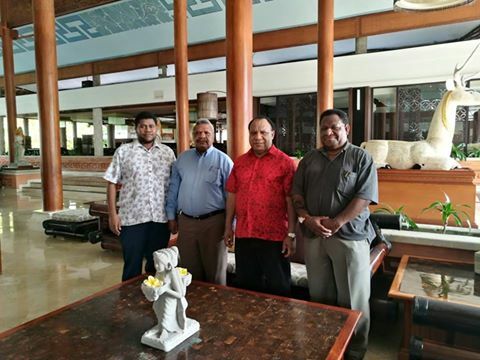 Papua New Guinea’s Foreign Minister, Rimbink Pato arrived in Bali, Indonesia on 6 December 2016 to attend the 9th Bali Democracy Forum from 8-9 December 2016, at the invitation of the Indonesian Government. Minister Pato will be accompanied by Papua New Guinea’s Ambassador to Indonesia Commodore (Ret’d) Peter Ilau, including officials from the Papua New Guinea Ministry and Department of Foreign Affairs. The Bali Democracy Forum is an institution dedicated to promote regional and international cooperation in the field of democracy since its inception by the Indonesian Government in 2008. The 9th Bali Democracy Forum will bear the theme “Religion, Democracy, and Pluralism”, with the agenda to explore the new understanding on the rise of religious identities, the dynamics of pluralism, and the question of democratic responses. Pluralism as a political philosophy is the recognition and affirmation of diversity within a political body, which permits the peaceful coexistence of different interests, convictions and lifestyles. The recent trends in migration, identity politics, and global security have posed challenges in the Asia Pacific and the regions beyond. The question is now about religion and civic pluralism worldwide. The significance of religion in the policy-making of developed democracies directly corresponds with the influx of current migrations from the Middle Eastern and North African countries into the Asia Pacific region. This is because migrants shape the destination countries’ new demographic and economic environment, which subsequently leads to further issues of pluralism, politics, and security. Similarly, as governments across the region, including Papua New Guinea, struggle to respond to the cultural and religious challenges brought by generations of immigration, the immigrants also have difficulties assimilating into mainstream societies whereby they become geographically ghettoized and economically marginalized. Significantly, such socio-economic alienation has led to religious intensification and violent extremism, especially among second-generation Muslim immigrants. For democratizing countries, the significance of domestic movement of peoples (urbanization, transmigration, and migration) lies in how it affects the regional political landscape and identity politics. Such movement changes the region’s social and demographic contours by affecting voter composition, redistributing resources and services and questioning state impartiality, thereby shaping the new political economy landscape of these countries. Identity politics further complicates this as conflicts may be provoked from intolerance and discrimination resulting from the politicization of differences in the values, institutions, and cultures of migrants from that of the majority. Acts of terrorism and the emergence of social violence are often indirectly linked to the shifts in demographic and political contours, which subsequently threaten national, regional, and global security. Across Western Europe, both Christian and Muslim communities have become breeding grounds for disaffection and disengagement from pluralist practices. While anti-immigrant groups accuse migrants for stealing jobs and using violence to spread their beliefs, those who are sympathetic to the migrants are often scorned for their perceived lack of nationalism. Such social and economic upheaval makes it difficult for state actors to develop strategic agendas to deal with the changing conditions and ultimately, promote pluralism. These realities mean that there is a pressing need for a sharper understanding of the situation on the ground in order to formulate comprehensive solutions to the security concerns currently faced by Western Europe and developing democracies worldwide. The 9th BDF will have two (2) discussion sessions around the sub-themes of promoting democracy and religious harmony in responding to the challenges of pluralism, and sharing best practices and key lessons in fostering religious harmony and countering violent extremism and discrimination through democratic responses, respectively. Foreign Minister Pato and the delegation stand ready to participate actively in the discussions of the Forum and see how these discussions will assist Papua New Guinea’s Government and policy makers in managing the issue of pluralism, with the recent influx of migrants to Papua New Guinea, particularly in managing the interests of these migrants and those of PNG citizens in various communities around the country, so that both co-exist in a harmonious environment. On the margins of the 9th BDF, it is also anticipated that Foreign Minister Pato will have bilateral meetings with the Indonesian Foreign Minister, H.E. Retno L.P. Marsudi, including Ministers of Papua New Guinea’s other bilateral partners in the region. Foreign Minister Pato was met on arrival by Consul General Geoffrey Wiri and officers from the Consulate in Jayapura who were in Bali for a separate conference, but were on hand to brief the Minister on the meeting and the situation in the Provinces of West Papua, Papua and other Melanesian Provinces of the Republic of Indonesia.